My prize is...A $100 Amazon Gift Card! Simply enter on the Rafflecoptor form below! This sweepstakes is open to US residents 18+ until 11:59PM EST on October 07,2012. Void where prohibited, No purchase necessary. This contest is not affiliated with Facebook in any way. Winner will be drawn using Rafflecopter's random number generator and will be notified via e-mail. Once notification is sent, winner will have 48 hours to claim their prizes. All entries will be verified, so please play fairly and keep it fun for everyone! 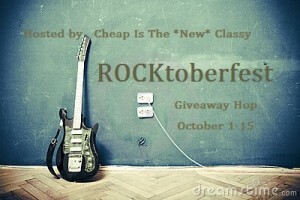 Welcome to ROCKtoberfest hosted by Cheap Is The *New* Classy! Many bloggers have come together to bring you this awesome music themed giveaway hop! This event runs until 10/15 to give you plenty of time to enter on everyone's blog for more chances to win fabulous prizes! All of the prizes are music related and worth at least $25! The GRAND PRIZE for this event is an autographed prize pack sponsored by Grammy Award winning souther rock and country group - Kentucky Headhunters! After you are entering on this blog, please come and enter for this fabulous Kentucky Headhunters prize pack at Cheap Is The *New* Classy which is open to US/CAN! Sassy Steals Christmas in October Giveaway! Hosted by Pink Ninja Media and Jenn's Blah Blah Blog. Hosted by, Pink Ninja Media and Jenn's Blah Blah Blog. Co-hosts Adventures of a Military Family of 8, Stay a Stay at Home Mom, and Simply Shawn & Jenn. KitchenAid Mixers are the BEST, and I know I would love to find one under the tree this year! Disclaimer: This blog is not responsible for shipping prize to winner, nor did I accept any compensation for this promotion. Have you ever wished you could find a dress that fits perfectly and complements your unique body type? I always have a hard time finding dresses that flatter me. After 3 kids and just as many c-sections, my figure isn't the same as it once was.Come on, I know all of you moms out there know what I'm talking about! That's why I was so excited to get the opportunity to be a part of the Fashionista eShakti event. Let me tell you a bit about eShakti and what makes them a cut above the rest in the fashion world. Shakti means power in Sanskrit. eShakti lives up to their name completely by giving a woman total power over the garments she purchases at their online boutique. You see, not only do they offer classically beautiful, feminine looks in sizes 0-26, all of their garments can also be fully customized just for YOUR unique body. You can shop by predetermined size or you can have a garment made specifically catered to your measurements, ensuring a figure flattering result every single time. On top of custom measurements, you can also revise certain details of your tops, pants and dresses from eShakti. Some of the common alterations include skirt length, type and length of sleeve, as well as neckline. Never before have women had so many options when shopping for clothing! What makes this even better? Not only is every piece 100% satisfaction guaranteed, they are also offered at extremely affordable prices that won't break the bank. You can look like a million dollars and not have to spend an arm and a leg. KitchenAid Mixer Giveaway Sign-Ups Are Open! HURRY! 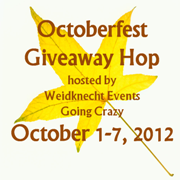 Giveaway will run from Monday October 1, 2012 until October 14, 2012 and we would love for you to join us. Sign up's are only open for a short time. Fill out the form below to join us. Join us and sign up for the Kitchenaide Mixer Giveaway. For Sophie, we wanted something special that would always remind her of how very loved she is. That's why I was so excited to get the opportunity to review a wall decal from the awesome folks at Vinyl Disorder. We chose a 36" wall quote that simply reads "Daddy's Girl". This was an easy choice since Sophie is most definitely just that. Whenever she's sad, Daddy is always there to kiss away her tears and make everything all better. Vinyl Disorder is an amazing company that offers thousands of designs suitable for walls and even vehicles. All of their products are available in a wide variety of colors and sizes, so you're sure to find the perfect design for any space. They have designs suitable for all ages and tastes, from mild to wild. Each and every piece is created just prior to shipping to your exact specifications. This ensures you will always receive products of the best possible quality with the longest life expectancy. You can even create your own custom designs! If your kids are anything like mine, you probably already know all about "Wow! Wow! Wubbzy!" This fun-filled show has been a hit with young viewers and their families since its 2006 TV premiere on Nickelodeon®, and it currently airs daily on Nick Jr®. Wubbzy is a fun, lovable, curious little guy who just likes to play, play, play with his friends in the eye-popping town of Wuzzleburg. The top-rated series supports preschool social skills – sharing, listening, compromising, helping and appreciating others, self-awareness and the use of humor as a coping skill. Although their world is more fanciful and imaginative than our own, Wubbzy and his friends deal with the same social and developmental issues faced by preschoolers. They learn how they fit into a group, how to understand their own feelings and those of others, how to get along with one another and about the value of friendship and community. My toddlers, Sophie and Xander, love this program and clap, giggle, and dance around whole they watch it. It's really quite cute! They love the colorful, friendly characters in the show, and as a Mom, I love the fact that they learn valuable life lessons from Wubbzy and his pals. The show is always age appropriate and never has any questionable content. My daughter is a total girly-girl. She loves playing dress-up and she even loves trying to lug around my purses. Yep, at almost 3 years old, we can already tell that she's going to be quite the diva. My husband jokes constantly that he's going to have to get a shot-gun to chase the boys off when she's a teenager, since they'll probably be knocking our door down. So when I received the opportunity to review the Hello Kitty I Heart Kitty Messenger Bag, I knew my daughter would be absolutely ecstatic! This messenger style backpack is very feminine with the trademark Hello Kitty face and is even adorned with hot pink and gold sequins to give it some sparkle. The hot pink and black color scheme gives it an edgy, punk-rock feel, which its totally my Sophie's style! This would make a great backpack for the teens and tweens in your life, and it could easily double as a purse or weekend bag for little ones for all of those trips to Grandma's house. Talk about versatility! Want To Be A Land Owner? Giveaway Coming Soon! As you all know, my husband and I recently became homeowners. We moved from Virginia to my hometown in Ohio. Owning our own property feels amazing, and I love the fact that my kids will have somewhere to call home for many, many years to come. Owning property can be a tricky and often expensive endeavor, though. That's where the folks at LandCentral can help. They will be giving one lucky winner land of their own, for FREE. Yes, really! Mompact is partnering with www.landcentral.com to giveaway a piece of property. Yes, we are turning a random site visitor into a land owner! The winner even gets to select which property she would like to have from a selection of five properties that are currently available. LandCentral allows people to buy land with very low money down, no real estate agent, and no credit check. This promotion will run from October 1, 2012-October 31, 2012. Be sure to enter, and start making plans for that dream home on your very own land!